At Brocklands we only use native trees and plants. 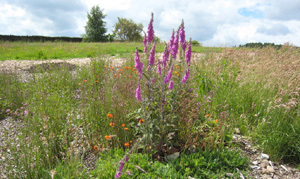 Increasingly, families want to be involved in planting flowers on graves themselves and so in response to this we have put together the following wildflower collections. These are available from January onwards for the bulb collections, and usually from March onwards for the Wildflower Collections. All the plants come from a specialist native nursery in Northern England. and selection from more than one category. 01729 840102, or Alternatively you may order by letter with an appropriate cheque. Flowers in May - violet-blue, hanging, trumpet-shaped blooms with sweet scent. Available for planting 'in the green' in February. Flowers in February/March; delicate nodding white heads with green centre. Available for planting in January/February 'in the green'. Flowers in March/April; nodding yellow flowers, smaller than garden subject. Available for planting February to April 'in the green'. The native variety which produces yellow flowers with deep yellow eye from March to May. Flowers April onwards, with masses of small rose and pink clusters. Flowers June-September - clumps of bright orange flowers with yellow centres. Flowers in July with rounded heads of blue-lilac on tall stems. Flowers May onwards - tall with white petals and big yellow centres. Also known as Dog Daisy. Flowers June-September with strong pink trumpets hanging from tall spikes. Greyish leaves, flowers blue, rose pink or white resembling Grannys Bonnets. Open woodland. A handsome plant with bright blue flowers over 2cm across, good bee plant. Dandelion like yellow flowers. Sun. 15-45 cm June onwards. Bright red-purple spikes. Damp. 60-120 cm June-August. Flowers violet/purple calyx; up to 20 cm. June onwards. 'Eggs and Bacon' Lovely clusters of yellow/orange pea-like flowers, May onwards. Flowers blue violet. Shade tolerant. 5-10 cm April-June. Flowers May-July - several dainty pink flowers with 'ragged' petals on each stem. The information contained in this website is for general information purposes only. The information is provided by Brocklands Woodland Burial and while we endeavour to keep the information up to date and correct, we make no representations or warranties of any kind, express or implied, about the completeness, accuracy, reliability, suitability or availability with respect to the website or the information, products, services, or related graphics contained on the website for any purpose. Any reliance you place on such information is therefore strictly at your own risk. In no event will we be liable for any loss or damage including without limitation, indirect or consequential loss or damage, or any loss or damage whatsoever arising from loss of data or profits arising out of, or in connection with, the use of this website. Through this website you are able to link to other websites which are not under our control. We have no control over the nature, content and availability of those sites. The inclusion of any links does not necessarily imply a recommendation or endorse the views expressed within them. Every effort is made to keep the website up and running smoothly. However, we take no responsibility for, and will not be liable for, the website being temporarily unavailable due to technical issues beyond our control.